At Magor Marsh BioBlitz you can explore the amazing reserve at Magor Marsh as we celebrate our local wildlife. 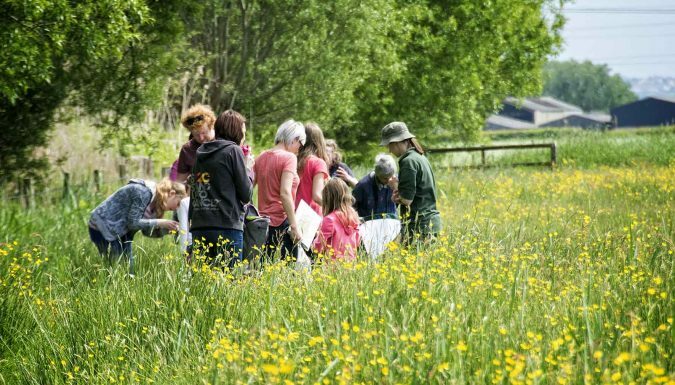 Drop in and see us on the day for some amazing activities as we have a rummage in the undergrowth and meadows, pond dip and bug hunt, use binoculars and sweep nets to discover everything that is here. £2 per child. Free for adults. From NEWPORT: take the A48 east towards Chepstow. At Langstone turn right onto the B4245 for the village of Magor. On reaching the small roundabout at Magor, continue into the village for about 400m, and then turn right into Newport Road (signposted to Redwick). Follow this road round left and right-hand bends, proceed past the ruins of the Priory on your left and over the narrow railway bridge. Immediately after crossing the bridge, turn left and follow this road for about half a mile. The reserve entrance is on the right (about 250m after the right-hand bend which takes you away from the railway line). Park in the small car park beside the Education centre. From M4, Junction 23a: From the motorway roundabout, follow the signs into Magor village on the B4245. These will bring you down a slip road to a small roundabout opposite a police depot. Turn right here, proceeding into the village for about 400m, and then take the right turn into Newport Road (signposted to Redwick, and then follow the directions as for arrival from Newport. From Chepstow: take the M48 to join the M4 then proceed as for the directions above, from Junction 23a. Alternatively take the A48 to the Rock and Fountain Inn at Penhow, then turn left signposted St Brides Netherwent. Follow this road for several miles until you pass under the motorway bridge upon entering Magor. Turn left at the T-junction then immediately right, signposted Redwick. Follow this road round left and right-hand bends past the Priory ruins and over the railway bridge, then follow the directions as for arrival from Newport.